We're Excellent At This, Even If We Say So Ourselves! We have the capacity to do many different types of embellishments including embroidery, screen printing and digital printing. We use the latest technology which guarantees excellent quality. The Vastex screen print machine gives us the capability to do numbering and names on Team Jerseys. This also allows us to create sample and short production runs on up to 10 colors. We have reliable access to screen printing capability with our contractor. Here we can produce large or small volume with a wide range of equipment including M+R 18 Head Challenger and 12 Head Gauntlets. 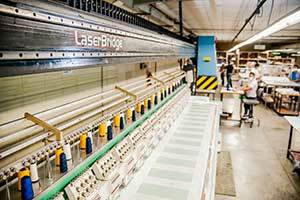 We have a Proel Laser Bridge which we use to do the Twill and Embroidery on Team Jerseys. This is the vary latest in technology and gives us the speed and quality to meet the needs of this market. Also we have more small laser machines which we use to do the Twill cut with speed and quality to meet the needs of this market. Everything you need in embellishments. Custom to large volume sublimation, screen printing and embroidery.